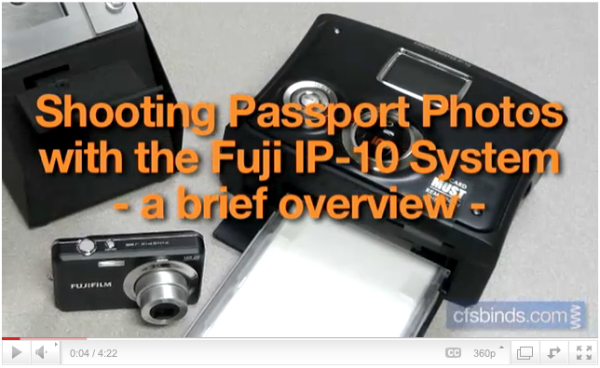 A common question that we get is, “How exactly does the Fuji IP-10 Digital Passport System work?” We thought there was no better way than to show you through the wonder of online video. The clip below shows just how easy and quickly you can take passport photos with this simple-to-use digital camera & printer system. There are two ‘Easy Operation’ modes that are built into the IP10 printer. Both allow you to quickly print the photos directly from the camera, without the need for a computer or removing flash memory cards. Easy Operation A mode is the simplest and quickest setting. Shoot the pictures with the camera & delete any photos that you do not want. Then, once the camera’s USB cable is connected to the printer, press the PRINT button. The printer will print one sheet with 2 identical photos for every photo you have stored on the camera. You can even have the photos deleted off the camera once the printer automatically downloads them. So with the push of 2 buttons you can quickly deliver quality passport photos in just minutes! Well, it actually takes only 90 seconds for the print to be produced, your time in settting up and taking of the photo will vary. But once you get into the swing of it, we’re confident you’ll appreciate the ease and speed of digital passport cameras. Easy Operation B mode allows you a bit more control. Once you shoot all the picture you may need, hook the camera up to the printer’s USB cable. It then downloads all of the photos to the printer and it allow you to choose which photo(s) you would like to print. This setting also allows you to delete the photos from the camera once downloaded. There’s no doubt that this method saves plenty of time as well as costly material mistakes over the traditional film-based processes of days past. In fact, it seems that many film manufacturers are phasing out much of their older style passport film in favor of digital media. The zero waste factor of digital cameras gives you the ability to ensure you have the right picture before you send it to the printer. It’s easy to see why the Fuji IP-10 system is the preferred choice for Homeland Security/ICE offices nationwide. Rather than try to describe in detail the process to setup the camera, the printer & composing the subject, we feel a video is worth a million words, so check out the video clip above for a detailed walkthrough. The video also shows how easy it is to trim your passport photos down using a passport photo cutter. Additionally, we have created a quick reference PDF guide to keep on hand near your system in case you need a quick refresher or if you should have to train a new employee. You candownload it here. For tips on how to take optimal passport photos, see our blog post: 8 Requirements For A Proper Passport Photo. Are there any time-saving tips you have for shooting passport photos? We’d love for you to share them in the comments below.